The Gunboat 55, patterns for which came from our Bristol facility, was just recently named Cruising World’s Domestic Boat of the Year and Best Multihull Cruiser, SAIL Magazine’s 2015 Best Boat overall, and Sailing World’s 2015 Best Multihull. As we finish painting and sanding the Gunboat 78 deck, we take great delight in watching the “little” Gunboat do so well. “The Gunboat 55 is the first of what looks poised to possibly be a long run of this design,” said judge Tim Murphy. “I was really stunned – I guess that’s the word – with how many things I felt they got right. The construction is infused carbon fiber and West System epoxy, it’s stiff and light, all top notch. The helm and workstation, all inside the main cabin, not outside as with previous Gunboats, is a marvel of design and engineering. Symmetrix Composite Tooling has worked with customers across the country and around the world, but there’s something special about people just around the corner. 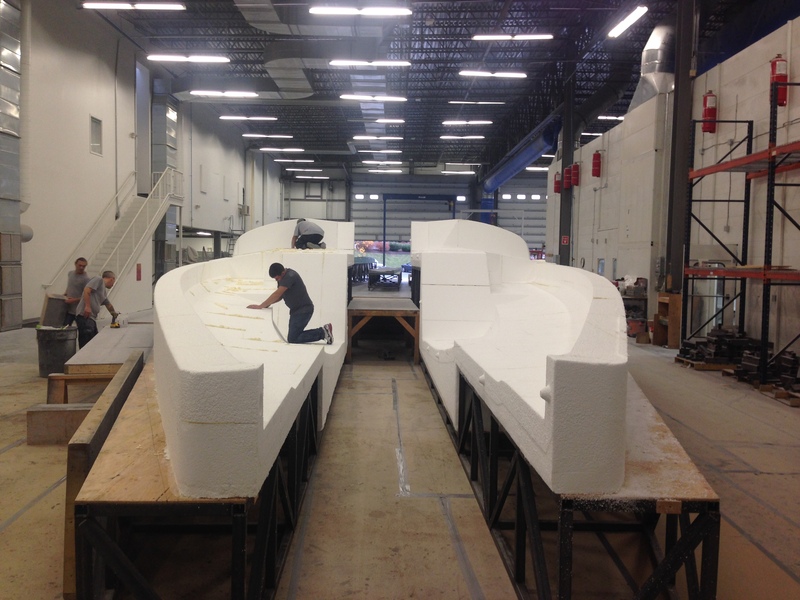 Carbon Ocean Yacht is a custom boat builder located down the street in Bristol, Rhode Island. COY has an impressive resume of boats and parts they have built and projects managed, and this project is no exception. 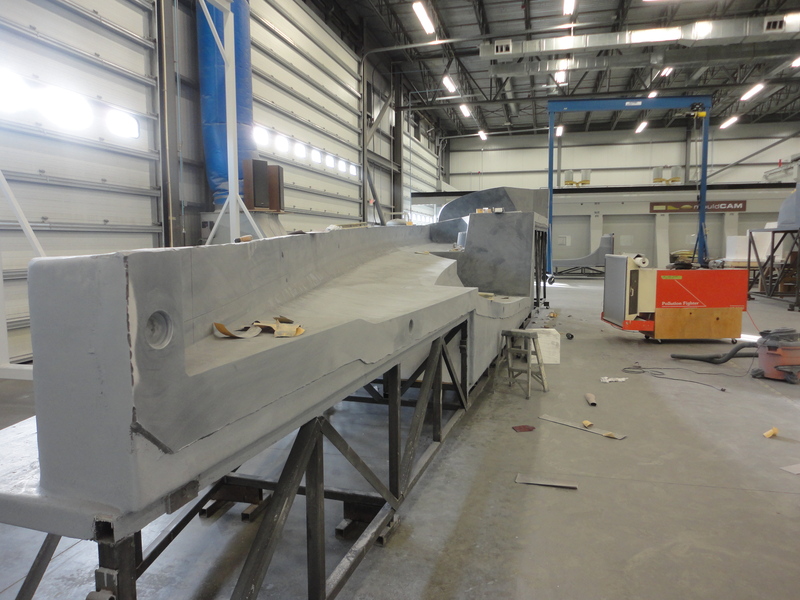 Symmetrix was hired to build a plug for the deck of the Owen Clarke Design Class40 COY is building for Energy Freedom Ocean Racing. The Class40 has been seeing great growth in recent years as a short hand sailor. The class is set by a box design, meaning, the finished boat may not exceed the established overall dimensions but does not determine the exact design of the boat. This goes a long way to providing equally matched boats, both new builds and comparing older boats to new ones, as well as keeping budgets to a minimum. As the class grows, so does its talent depth. The depth of the design team associated with this Class40 is amazing, including naval architects Owen Clark Design & America’s Cup designer Clay Oliver, engineering by PURE and weather modelling data from Chris Bedford. With all this help, the designers are still realistic. Lead designer, Merfyn Owen told COY, “We expect some real innovation and quality in the build from Carbon Ocean Yachts and I’m sure it will be the quickest boat on ‘paper’. However, history tells us that those with current boats need not despair! Wise sailors know and my experience of racing in the class in the US, for the last five years, tells me that especially in short-handed sailing, once the hull gets wet; experience, local knowledge, preparation and good old ‘time on the water’ are all great levelers.” The build of a new boat, including the tooling that can be used to build future boats, means great things for the US class. It also means great things for Bristol, Rhode Island. 90% of the boat will be sourced and built in Rhode Island – from the boat to the mast to the sails. Rhode Island has a long history of boat building, from the Herreshoffs through to the present, and a project like this does well to reemphasize the strong maritime roots while accentuating its position into new and sophisticated build techniques. Symmetrix’s role in this build is providing for COY a 5 axis CNC machined direct-to-mold female plug. Starting with the confirmation of the CAD drawings from COY’s engineers, to issuing a cutting authorization, Symmetrix then starts doing what we do best. The frame was built, plywood and foam laid, and then it was time for the machine. On hand was local celebrity Billy Black to document the rough cutting – hopefully not too much of our EPS foam ended up in his camera! The COY team was able to stop by the shop on a regular basis to inspect the quality of the build, and as we expected, there were no complaints. Symmetrix finds such smaller projects just as exciting as the 56.9m wind turbine that left the shop to make way for this Class40. Engaged builders, customers, and designers never fail to provide impressive, innovative design. We look forward to seeing Energy Freedom Ocean Racing out on Narragansett Bay. For a wonderfully in depth look at this boat and the design process, check out this article from Owen Clark Design. While we were stuffing ourselves with turkey, this little-engine-that-could was busy ripping through the paste. Watch how we go from rough paste to a smooth surface. It does two rounds over each surface with different tools, the first is a rough, the second more detailed. If you watch closely, you can see Billy Black filming part of the cut. 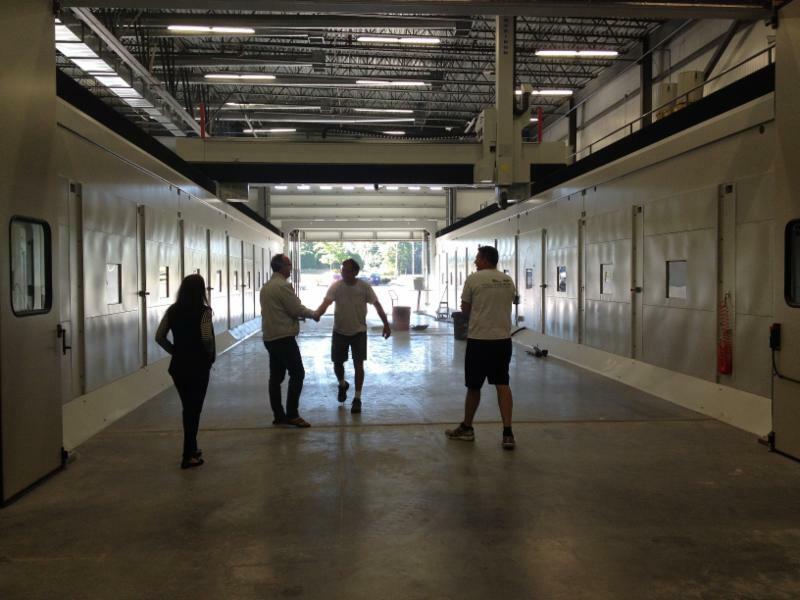 While in Rhode Island, Gunboat dropped by Symmetrix’s headquarters for a tour. Housing their new, large format 5-Axis CNC machine, the state of the art facility is quite impressive. 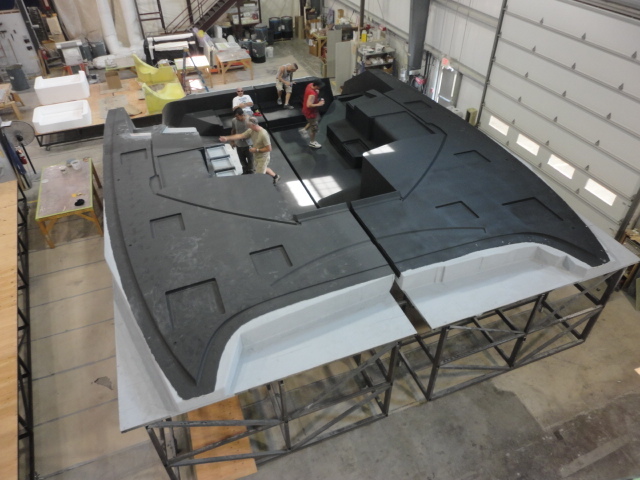 Currently contracted to build the deck mold for the GUNBOAT 78, we anticipate many future collaborations with Symmetrix. Keep your eyes here for more details as they develop.